Today is the first time I took Shean Wenn out on a bus without her stroller. It is actually just a short ride away to the dentist (probably 7 mins on the bus but 30 minutes to walk). It was very chilly today (2-3c) and I was in pain so I decided we should just take the bus. Before the trip, I already told her I expect her to behave herself, hold my hand all the time when we walk and definitely no running around on her own, "There are alot of cars on the road & it is very dangerous." She nodded that she understands. We left the house at 1030am for my 1050am appointment. We arrived just in time! After waiting for about 15mins, the dentist asked us to go in. It seems my wisdom tooth not only erupted but also caused an infection in my gums. The dentist, she gave me an antibiotic and stronger painkillers because I told her for the past 4 days, I was using paracetamol to help my pain and even that, it only helped me for 2 hours. She also asked me if I wanted to extract it and I said i would! It is unbearable! She gave me a referral to another clinic where they have the facilities to do so. I did my first extraction of wisdom tooth 2 years ago there. It was such a breeze. Shean Wenn was very well-behaved throughout my consult and was given a sticker by the dental assistant. She was obviously very happy with that! On the way back, I stopped by a pharmacy to get my medication and initially thought we could walk home (15minutes walk). But then it started to drizzle slightly, SW was beginning to show she was tired from walking (from bus stops to dental clinic & to pharmacy) and my mouth was in serious pain. Anyway, I spotted the bus coming our direction so hurried to the bus stop to wait for it. It was only a 1minute ride home but I didn't care. When we arrived, I quickly took some medication and rest. The "strong" painkillers took TWO hours to work its "magic" and I was silently cursing - even the panadol can work in 30minutes!!! 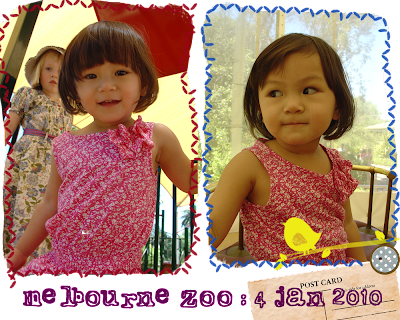 2 Feb 2010 : Shean Wenn at 31 Months Old. Today while I was at the computer, I heard a little voice saying "hide and seek, hide and seek. Can you find me?" I turned around and saw no one. And no, I was not imagining things..
One of the many ways she entertains herself (and myself) during the day when we don't go out. This morning I gave her a bunch of colour pencils and papers. She starts to doodle and I was watching her & telling her "Why don't you write me an A". She tried many times until I was satisfied with her A. (She was writing it like an upside U with a line across. I told her the lines has to be distinct like a Triangle). Then she proceeded to write 7, C & P but all terbalik (mirror image). She actually writes her 7 from the bottom up (instead of top to bottom). It's funny! I told her it is not the right side but still complimented her on her effort. I have read about this "phenomenon" as well, people saying their pre-schooler writing alphabets or numbers in a mirror-image. I wonder what made them do this? Anyhow, it isn't a big concern to me at the moment because I think it's just the way they view things at the moment. But any ideas/comments/links to this would be appreciated.